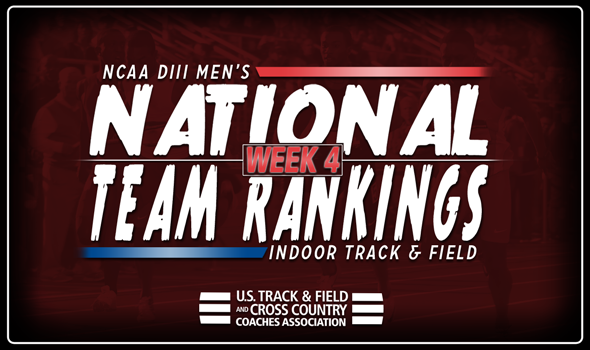 NEW ORLEANS – Change absolutely ripped through the NCAA Division III Men’s National Team Computer Rankings in Week 4 as preseason marks were thrown out in non-combined events, leaving just those recorded this season to be calculated. Eighteen of the top-25 teams – as released Tuesday by the U.S. Track & Field and Cross Country Coaches Association (USTFCCCA) – moved multiple spots. Thirteen of those teams had upward trajectory, while five slid in the other direction. The top-5 looks a little bit different, but not for North Central (Ill.) and MIT. The Cardinals and Engineers are still No. 1 and No. 3, respectively. North Central (Ill.) actually strengthened its hold on the No. 1 spot as it gained 43.78 points from Week 3. Mount Union was the biggest gainer of the week in the top-10 as it went from No. 8 to No. 2. This is the highest the Purple Raiders have been ranked since Week 6 of 2015. Mount Union can thank Louis Berry, Mason Plant and its 4×400 team, which all rank in the top-2 of the NCAA DIII Descending Order List. Plant took over the top ranking in the 60 hurdles this past weekend when he clocked a time of 8.02. Speaking of the 60 hurdles, Rowan watched Bobby Cooks reel off a time of 8.04 in the event and is now No. 2 nationally. That helped the Profs climb from No. 7 to No. 4. That wasn’t all that happened for Rowan as Harrison Escoffery cleared 2.14m (7-0¼) in the high jump and is No. 1 on the NCAA DIII Descending Order List. St. John Fisher continued its climb in the rankings as it went from No. 15 to No. 13 to No. 10 in a matter of weeks. The Cardinals are looking for big points in the postseason from Mark Vanmarter, who is currently ranked No. 1 nationally in the long jump at 7.36m (24-1¾). Tufts comes in at No. 16, up six spots from Week 3. The Jumbos own the second best DMR in the nation with its time of 9:54.92, which couples well with the second-ranked 800 in the nation of 1:50.98, run by Hiroto Watanabe two weeks ago. UMass Dartmouth went from No. 36 to No. 19 and is led by thrower Jared Louf-Woods. The senior unleashed a heave of 19.23m (63-1¼) in the weight throw and is ranked No. 1 in that event nationally and No. 9 in the shot put. Worcester State, Wartburg, Bethel (Minn.) and Baldwin Wallace soared nine, 11, 41 and 20 spots, respectively between Week 3 and Week 4. We’ll release three more National Team Computer Rankings in advance of the 2018 NCAA Division III Indoor Track & Field Championships, which will be held March 9-10 in Birmingham, Alabama at the Birmingham CrossPlex.